I had never made enchilada sauce myself; it turns out that it is super simple! This was an easy way to turn leftover chicken into something new. I made this just for myself, so double it if you’re cooking for two. Enchiladas are not very photogenic, but they tasted much better than they looked! In a small saucepan, heat the vegetable oil and garlic until the garlic begins to sizzle. Add the flour and stir in with a whisk to make a roux. After the flour has cooked for about 30 seconds, add the tomato sauce, chili powder, cumin, water, and a pinch of salt. Simmer for 10 minutes, taste, and add additional salt if necessary. Spray a 9×9 inch casserole dish with nonstick cooking spray. Fill each tortilla with spinach and chicken, then roll loosely, with the seam on the bottom. 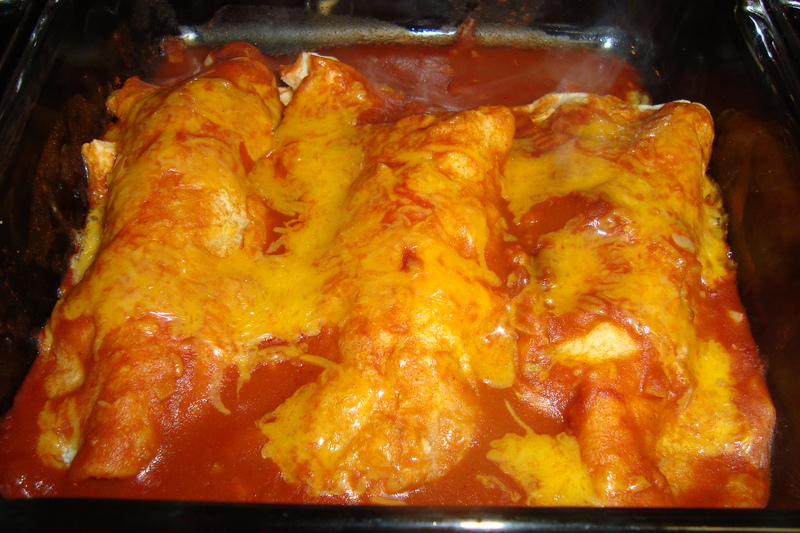 Cover in enchilada sauce and top with shredded cheese. 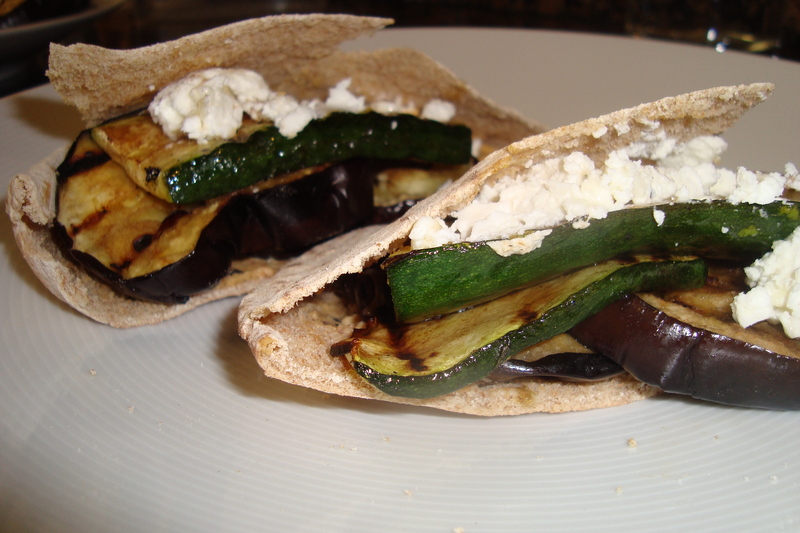 I used grilled eggplant and zucchini for these, but any grilled vegetables would work. Bell peppers, onions, mushrooms, anything that tastes good with a bit of char would be great. 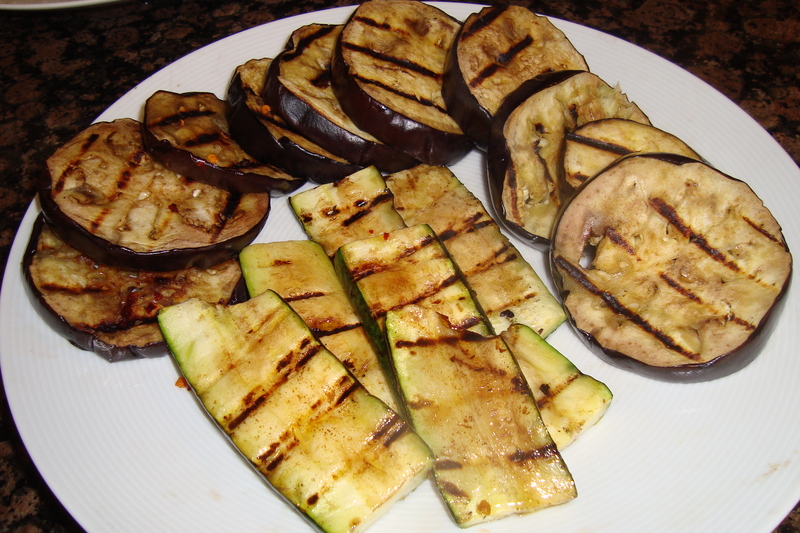 I grilled mine after brushing them with a combination of balsamic vinegar, olive oil, and red pepper flakes. The key to a good vegetable sandwich, in my opinion, is making sure that it’s not dry. You can accomplish this with a variety of spreads–aioli, cream cheese, hummus, pesto, guacamole, tapenade. . .whatever sounds good to you. Cut the pita bread in half, then toast or warm in the oven. Open the pita bread so that it forms a pocket. Spread hummus over the bottom half, then stuff with the vegetables. Top with goat cheese. That’s it! It’s not much of a “recipe,” but the combination was so delicious that I had to share it. Paco made this, isn’t it pretty and colorful? It’s a nice change from regular tacos. To make the beef, heat some vegetable oil in a skillet, then brown the beef and garlic, seasoning with salt, pepper, and cumin. 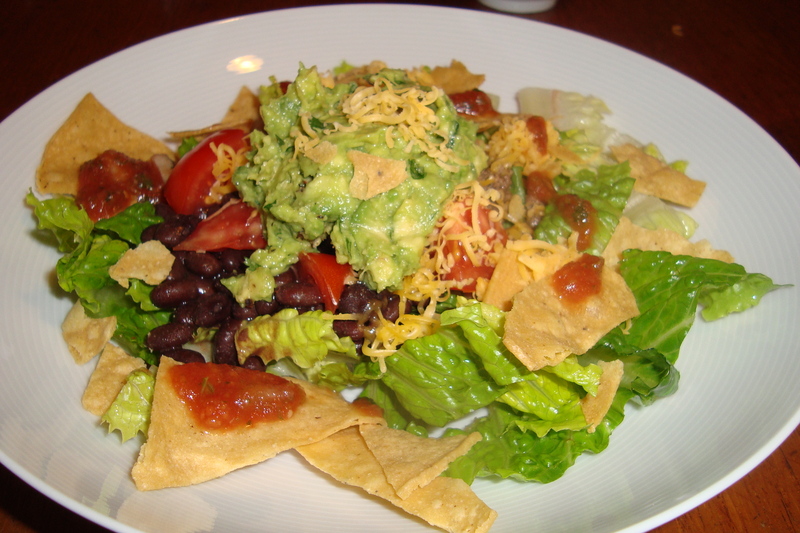 Layer the vegetables, beef, beans, cheese, guacamole, and salsa in a bowl, garnishing with crumbled chips. I made this as a side to Paco’s barbequed chicken, because I wanted to make something different from my usual barbeque sides (potato salad, cole slaw). It was a nice hot accompaniment, but this could definitely act as a main dish with a side of vegetables or salad. What I love about macaroni and cheese is there are a million different variations. You can use whatever cheese you’d like (I used what I had on hand). You can add eggs to make a more casserole-like dish. You can add vegetables or meat (broccoli, bacon). You can top it with breadcrumbs, potato chips, cracker crumbs, fried onions, or anything crispy. Preheat oven to 350 degrees F. Spray a 9 x 13-inch pan with cooking spray. Prepare the macaroni using the directions on the package, boiling until it’s a little bit short of al dente (one minute less than al dente). Remove from the heat and drain. 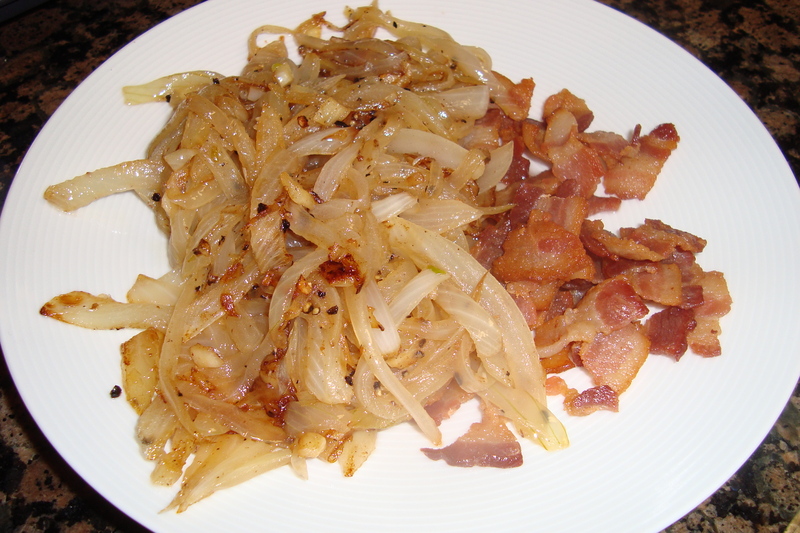 In a large skillet, brown the bacon until it is not quite crispy and most of the fat has rendered out. Remove the bacon from the pan. Add the onions and garlic to the bacon fat and toss in the fat. Season with pepper, and allow to caramelize. When the onions are golden but not falling apart, remove them from the pan as well. 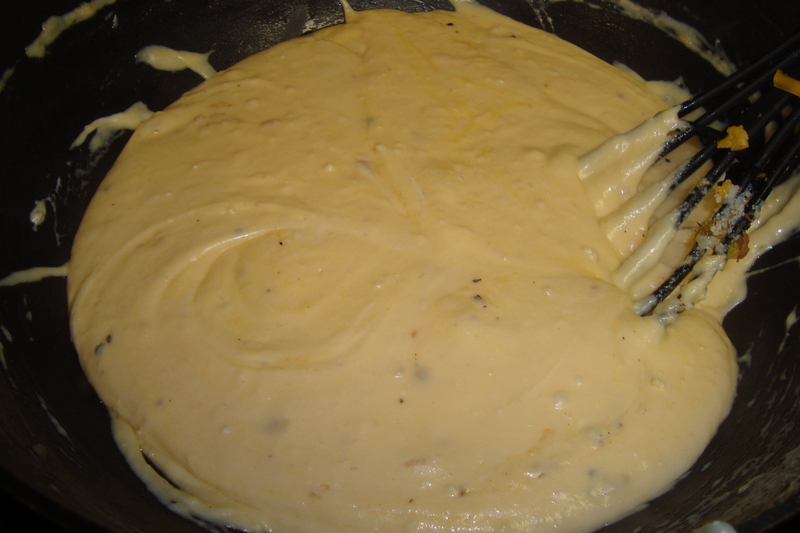 To make the cheese sauce, melt the butter in a large skillet. Add the flour, and stir with a whisk to break up the lumps. Allow to cook for a minute or two, then add the milk and cream. Bring to a gentle simmer, and stir continuously, allowing the mixture to cook for 5 minutes. Once it has thickened, add the cheese a little bit at the time, stirring continuously. Season with salt, pepper, cayenne, and Tabasco. 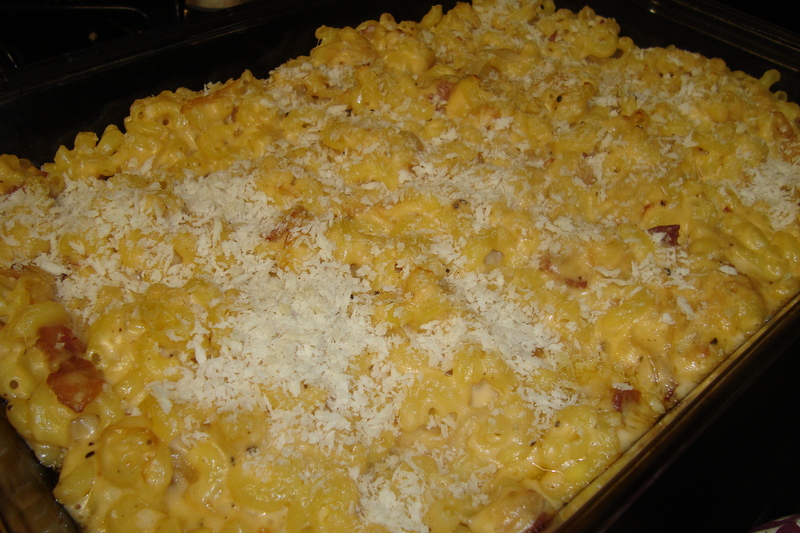 Add the caramelized onions, bacon, and pasta to the cheese sauce, mixing so that the macaroni is thoroughly coated. Sprinkle the panko over the top. Spread the macaroni into the baking pan, and bake for 20 minutes. I was trying to think of a quick appetizer that I haven’t made before, and I decided to try using premade naan as a base for flatbreads. There isn’t really a recipe for these, you can add whatever ingredients you’d like in any amounts. Saute mushrooms and garlic in a little bit of butter or olive oil. Once the mushrooms have started to brown, season with salt, pepper, and thyme. 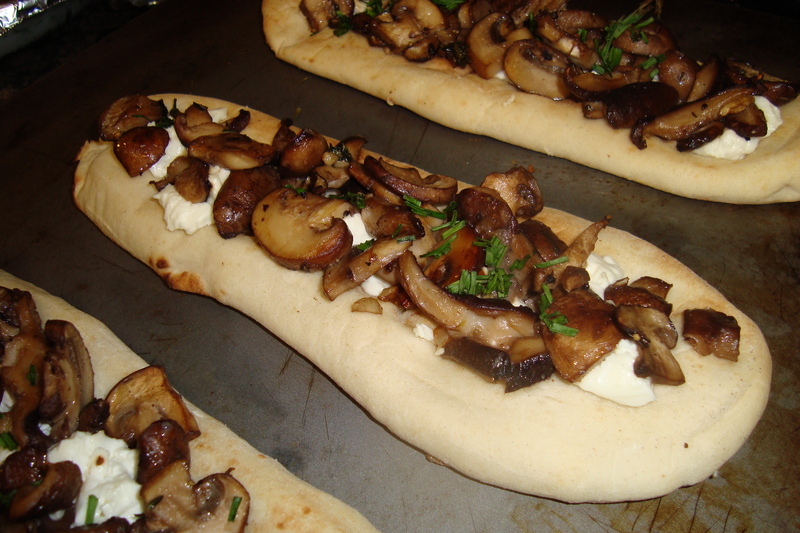 Spread each piece of naan with a little bit of goat cheese and top with the sauteed mushrooms and chives. Bake for 7 minutes, or until the naan is toasted. Cut each piece of naan into four pieces to serve.